Check out this raw, upper-body bodyweight routine that truly stems from a prison workout. This will definitely get you jailhouse strong and ripped, and what we’re going to do doesn’t get more bare bones than this. We’re basically doing push-ups, pull-ups, dips and ab wheels non-stop for 10-20 sets. Yeah, it’s pretty insane stuff, but it’s going to make your muscles look round, full and straight nasty. I did this workout for two weeks straight— doing 20 sets each time— alongside my training partner, former Ohio State running back Maurice Clarett, and the results were absolutely unreal. What piqued my interest with this particular workout is it works on so many different levels. 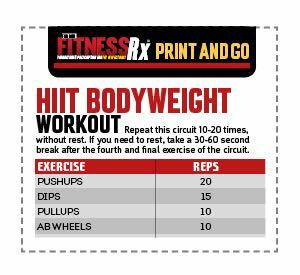 If you’re just trying to get strong overall and get your connective tissues better for heavy workloads, this workout will do that. If you’re trying to take your conditioning to another level and don’t want to worry about using much equipment, this also does that. This is a multi-joint movement with a HIIT approach, and it serves its purpose extremely well. I’ve thrown it in to round out the upper body and make you straight jailhouse jacked, and it more than does its job.